Assimilation², Volume 1 is the first of a two volume crossover story between the universes of Doctor Who and Star Trek: the Next Generation. It presents what happens when the Cybermen of Doctor Who join forces with the Borg Collective of Star Trek: the Next Generation. The graphic novel begins with the bow-tie wearing, time-traveling alien, (the Doctor) and his human companions (Amy and Rory) as they find themselves landing the TARDIS in what they think is California in the 1940s but turns out to in fact be a holodeck simulation aboard the Starship Enterprise. The reader then follows the adventure as members of both ships realise that the reason the TARDIS was able to slip into this universe was on the heels of Cyberman army (notorious for dimension/universe jumping at this point), which has now joined alliances with the Borg Collective for the mission of converting the universe. This is the crossover that seems as though it should have been done years ago. And while it may have happened many times in the writings of dedicated fanfiction authors, it only happened in the official canon storylines of both franchises(2012) very recently. Not only does it involve the crew of Next Generation and the 11th Doctor & companions, but it flashes back to the original Star Trek series characters and the 4th Doctor for extended sections of the story. Assimilation², Volume 1 definitely captures the attention of the reader and provides an engaging and captivating story. It definitely intrigued me enough to continue on to Assimilation², Volume 2 to see the story through to its conclusion. I mean, it has Star Trek, and it has Doctor Who, it has Data the android piloting the TARDIS with his mind--what more could a sci-fi media fan ask for? 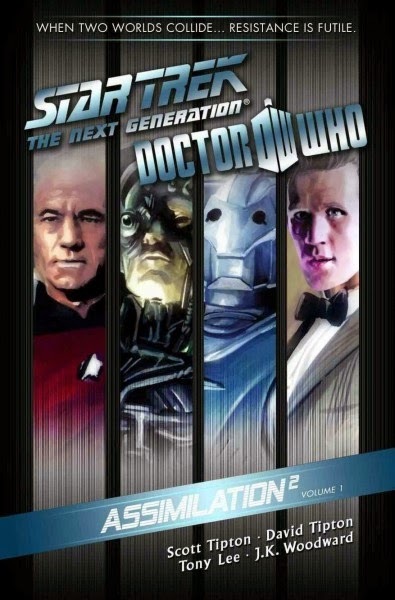 Doctor Who/Star Trek: the Next Generation: Assimilation², Volume 1 is available at the Ocean City Free Public Library.